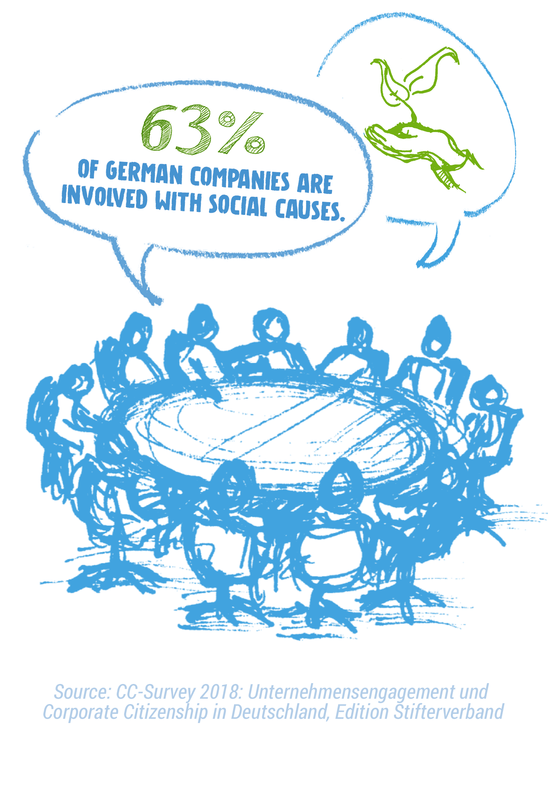 Two out of three businesses in Germany get involved on a regular basis with social projects that go beyond legal requirements. 9 out of 10 company representatives believe that firms should once again take on greater responsibility in acting as role models in society. developing a civic engagement profile tailored to your needs that includes strategic goals and target groups, defines roles and develops strategies for action. Society benefits as a number of energized individuals get involved where it counts, bringing valuable professional skills or other benefits to a social cause. Employees benefit because they can make a difference, develop an appreciation for other points of view and strengthen their skill set. Companies benefit because employee satisfaction increases, newly acquired skills have a positive impact on the core business, and compelling civic engagement activities attract new employees and junior staff. We work with you in building an effective corporate volunteering portfolio. We tailor the broader concept and its individual components to your business and staff. Whatever the activity or measure – from one-day campaigns to mentoring programs to social internships or pro bono services – we advise you on direction, resources and the practical tools at hand. We are convinced that more can be accomplished by working together. Whether you are working with local organizations on site or with other companies on regional or national projects – we are at your side helping you initiate and determine the shape of successful partnerships. We advise you on cooperating and linking up with nonprofits, foundations, government actors and other companies. We help you build strategic partnerships by providing everything from a catalogue of criteria to researching potential partner organizations to matching your organization with the ideal partner. When it comes to ensuring effective participation, we are at your side from start to finish, identifying relevant stakeholders, conducting an analysis of extant communication and participatory formats and developing and carrying out dialogue and inclusive processes. We strengthen existing cooperation efforts and collective impact networks by emphasizing impact-oriented management that targets a shared vision and set of goals, coordinating the operational rollout of activities, designing monitoring and evaluation systems and assisting with collective learning processes. Together with you, we plan for high-impact civic engagement and, when needed, are there to assist you in implementation. We analyze the outcomes and help you structure the expansion of your activity for scalability. We also provide consultancy services to help you communicate professionally and report on your civic engagement with transparency. This can involve social impact storytelling and reporting in line with the London Benchmarking Group or for the Dow Jones Sustainability Index. The success of your civic engagement and core business requires that principles be upheld and that standards of quality are met. The success of both also demands internal clarity and the adaptation of processes and structures to goals. We help you embed your corporate citizenship strategy and its impact-oriented implementation within your company for the long term. Together with you, we develop corporate guidelines (e.g., for engagement activity or donations) and other regulations. We clarify roles and responsibilities (e.g., relevant committees and functions). We design and optimize internal information and management processes, working with you to develop effective workflows. We set up key documentation for you, such as report templates or funding forms. We focus on impact for society as well your company. We foster partnerships that are built on equal footing and combine our strengths with yours. Together with you, we consider the challenges specific to your entire organization and the social environment. We value the work you do, combining this with an openness toward new goals and ways forward as the key to instituting effective change. Our partners trust PHINEO’s proven methods and the expertise we have gained from scores of projects and in-depth insights into more than 3,000 nonprofits. We are happy to discuss your questions or a potential cooperation with you directly.